Biryani is the ultimate favourite at restaurants especially when prepared with the finest spices. Now get the same flavour and fragrance at home with Knorr Chef’s Biryani Masala. Knorr Chef’s Biryani Masala gives your home cooked biryani the restaurant-like taste with the perfect flavour & fragrance. Next time you cook biryani, try Knorr Chef’s Biryani Masala and your family will forget their favourite restaurants. What's in our Biryani Masala? 1. Cook Restaurant-like Biryani at Home 2. Made by Knorr Chefs 3. With 'Special Freshness Lock'- Keeps your spices fresh for longer 4. With Perfect Flavour & Fragrance 5. With Knorr Chefs Masalas, you are the Master Chef of your kitchen 6. Chef's Tip: Garnish with fried onions and coriander or mint leaves. Serve hot with raita and salan. 1.In a deep pan, heat the oil and fry chopped onions till golden brown. Add chopped tomatoes, ginger garlic paste, coriander powder, red chilli, turmeric, salt and cook on low flame till oil separates. 2. 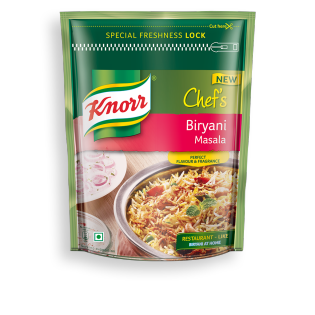 Add the chicken (or cut veggies) with 1 cup water an 2 tbsp (16 g) of Knorr Chef's Biryani Masala. Cover with lid and cook on low flame for 20 mins or till done. Sprinkle mint leaves on top. 3. Boil rice in 750 ml water with 2 tbsp oil and lemon juice. Cook till rice is nearly done. Drain excess water. Spread rice over cooked chicken (or vegetables). Cover the pan with a heavy lid and cook on low flame for 5-10 mins. Serve Hot!